IT is a town built around a temple, rising out of a legend. Deep in the heart of southern India, the ancient, bustling, town of Madurai is the epitome of Dravidian culture. This vibrant town, dating back to at least the 4th century BC, draws its resilient strength from the great temple that throbs in its heart. The pyramidal gopura, the gate-towers of the temple are richly encrusted with figures from our boundless stories: gods, demi-gods, monsters and even the enigmatic open maw of the yali often explained as creation pouring out of the mouth of time. The perimeter walls encircle a religious town of 65,000 sq meters enfolded within a thriving heritage city. Here lie labyrinths of shrines and shopping arcades, corridors, halls and a museum with a priceless wealth of traditional art. The museum is especially enchanting with exquisite bronze and stone sculptures, intricate wooden carvings and paintings depicting the tales from an amazing literary heritage. In fact, the temple has been sanctified by an unshakable belief in a tale of miraculous love. According to the story, a princess was born to the powerful Pandian dynasty. She was named Meenakshi, the ‘Fish-eyed’, because of her beautiful tip-tilted eyes. When the princess entered the temple and saw the idol of the handsome god, Lord Sundereshwar, she fell in love with him. And he with her. 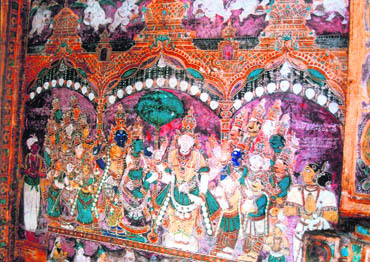 Meenakshi and Lord Sundereshwar were married and have lived happily ever after in this temple as depicted in an interesting mural of their wedding on one of its walls. Their marriage is commemorated every year in the brilliant Chitrai Festival and then, in the enormous tank known as Mariamman Teppakulam, there is the annual Float Festival. During the Float Festival, which is quite spectacular, the great temple tank glows with reflections of the illuminated temple. Across these shimmering waters moves the ‘float’, carrying the beautifully decorated processional idols to the sound of festive religious music. It seems like quite a stirring experience. According to the temple authorities, every month there are various festivals in Madurai. You don’t have to be a devout Hindu to appreciate the wonders of Meenakshi temple. Clearly, Meenakshi Sundereshwar temple is more than just a place of worship. It is a civic centre: inspiring, instructing, entertaining, conserving. As had happened in many old temples, endowments by successive rulers and rich devotees have added to its wealth of art. Virtually every pillar, the ceilings of every corridor, every subsidiary shrine is a tribute to the inspired skills of our artisans and artists. As one wanders around the temple, the senses are charged with the fragrance of smouldering sandalwood and camphor, sharpened by the tinkle of temple bells, and tingling with the cold touch of a freshly scrubbed stone floor. Among the many ageless things in the temple complex, there is a fearsome portrayal of the enraged Goddess, Durga. Devotees throw impacted butterballs onto her to keep her cool. A few steps away is the sculpture of Harihara: Vishnu, and Siva, portrayed together. Scholars contend that this great temple became a focal point for the reconciliation of the two contending faiths of Vishnavism and Saivism, merging them together. According to another belief, a scholar was accepted into the famed Tamil Sangam Academy only if his works floated in the temple’s tank. Traditional weavers still produce the famed Sungudi saris of Madurai. Once these gracefully flowing garments were dyed in the customary way but, today, waxed designs add an innovate touch. During the evenings, the sound-and-light show in the courtyard of Nayak’s Palace is a major attraction. 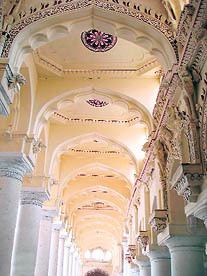 The palace is an Italianesque extravagance of gleaming white stucco pillars, with domes and high arches. The shadow-drenched foyer dramatises the luminous interiors. The glowing pillars are an amazing 20 m. high and have a circumference of 4 m. The central pavilion measures 75m x 52 m and is made entirely of brick and mortar without using a single rafter or girder. It was built in 1636 by the ruler Thirumalai Nayak and could have been a summer retreat. The 30-minute sound-and-light show, on the legendary life and times of Thirumalai Nayak, is quirt informative though one may not entirely agree with the almost mythical image of the ruler, portrayed in this show, but then one must accept a certain amount of fantasy in the richly embroidered heritage of this ancient city. Legends, like pearls, have enough time to grow in 2,400 years of unbroken history. How to get there: Madurai airport, about 15 km from the city off National Highway 47, is served by several domestic airlines. It is well connected from Chennai, Bangalore, Mumbai and New Delhi by buses and trains. Local transport: Local government-run buses are safe and cheap. However, the boards are only in Tamil, so check with the conductor. The auto rickshaws are not metered; negotiate the fare beforehand.AC and non-AC taxis and rented cars are available. 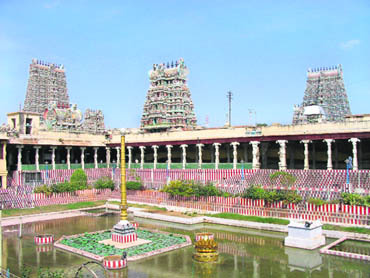 Festivals: Madurai is famous for the Chithrai Festival (mid April-May). The yearly bull run "Jallikattu" coincides with Pongal in January. Places to visit: Apart from Meenakshi temple, Vandiyur Mariamman Teppakulam is a temple built in the middle of a man-made pond. It is famous for its float festival that falls in the second half of January. Koodal Alagar Temple: Located in the heart of the city, it is dedicated to Lord Vishnu. Thiruparankundram: An old temple dedicated to Lord Muruga – Karthikeya, it is a rock-cut temple carved out of a mountain, just 8-km from the city. Things to buy: Handloom cotton Sungudi saris, brass works, Tanjore paintings, handicrafts and antiques. Pudumandapam is an old shopping area (about 500 years old). Local cuisine: Chettinadu cuisine. Do try dishes like Paruthi paal, jigarthanda, panangkarkandu paal and chettinadu varieties like appam, kuzhi paniyaram. Places to eat: Madurai Sri Muniyandi Vilas, Vaigai mess, Jaffer’s Home Biryani and Hotel Amsavalli for non-vegetarian food. Modern Restaurant, Hotel Meenakshi Bhavan, Murugan Idly Shop for authentic south Indian meal. Amma mess is another popular dining place among the locals and visitors. Also try the hot raw banana bhajias. Where to stay: There are budget hotels (HI Hostel, Hotel Sree Devi), mid-range hotels (Madurai Residency, Hotel North Gate) and luxury hotels (Heritance Madurai, GRT Regency).